QUESTION: Scope versus knee-snapper: How do you rate a horse that has lots of scope in his jump in a Pre-Green or First Year Green class versus the horse that snaps its knees higher over 3 foot jumps without the scope of the first horse? Do you favor one over the other? And in an Amateur Owner class, how do you weigh the more athletic scopey horse that may act a little green versus the consistent, packer amateur horse that lumbers around the course? Scope is the effortless quality of a hunter that denotes power, generally with a round bascule (natural arc of a horse’s body upon take-off) that enables the horse to jump large fences easily. 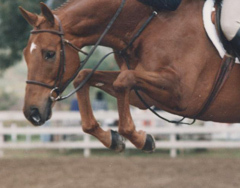 Often the scopey horse competing in lower-level divisions and/or jumping smaller fences, does not snap his knees as high as a horse without the quality of power and scope. This question invites our judges to comment on their assessment of green horses, and how they weigh the jumping form characteristics of tight knees and frontend versus the more powerful hind end quality of the scopey jumper. The second part of this question invites our judges to weigh in on scoring the athletic jumper with minor errors or green mistakes as compared to the experienced “packers” and consistent campaigners in the Junior/Amateur divisions.